Photographs & Plans showing the original 1864-65 grade & trestle alignment, depot, and turntable; the 1909 realignment; and the current double track grade, trestle over US I-80, and Tunnel #18. Document Images Courtesy Thomas Gregg Collection. Photographic Images Above Courtesy Barry A. Swackhamer Collection. 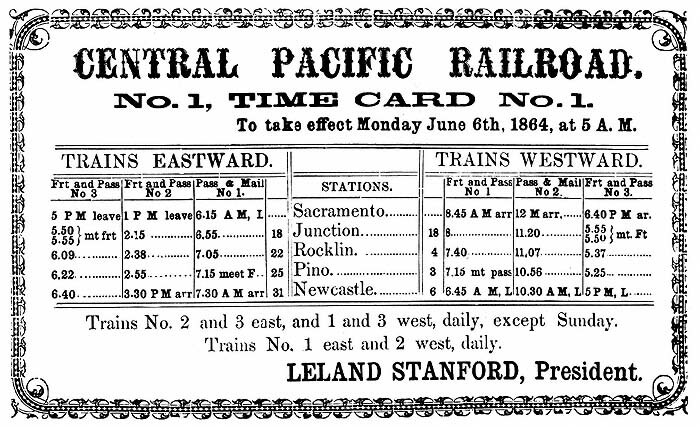 CPRR Timetable Card No. 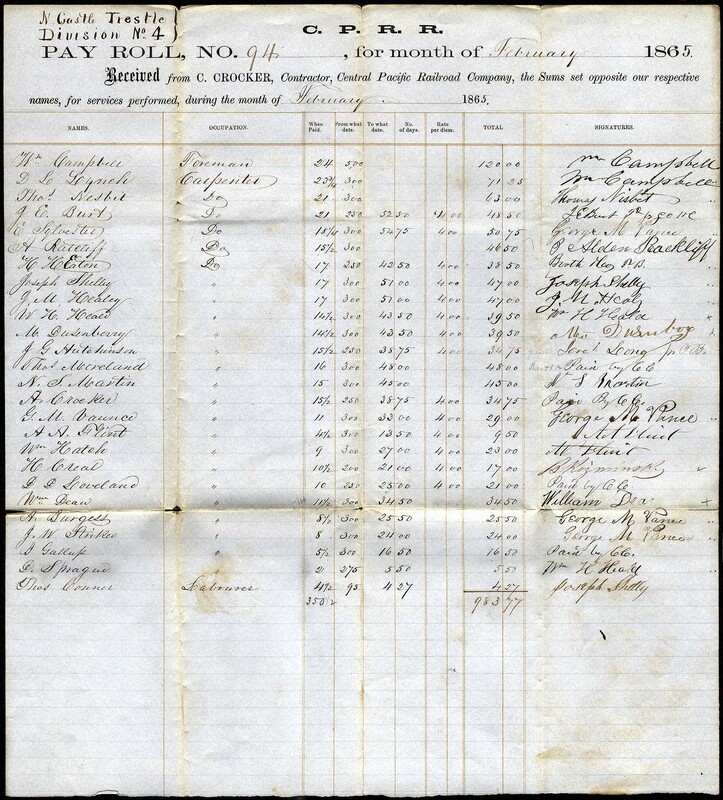 1, Sacramento to Newcastle, June 6, 1864. Courtesy Bruce C. Cooper Collection. A.A. Hart Stereoview #145, detail. 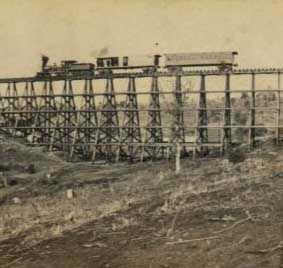 "Building Trestle at Newcastle, Placer County." 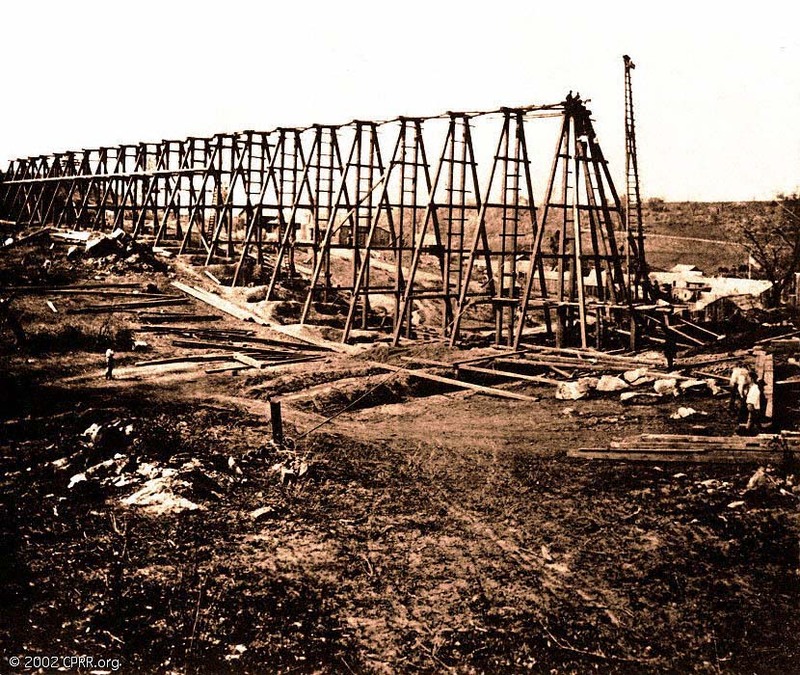 Newcastle Curve: 600 ft. long NewCastle Trestle, filled in, May, 1907 photo. Courtesy of the G.J. "Chris" Graves Collection. 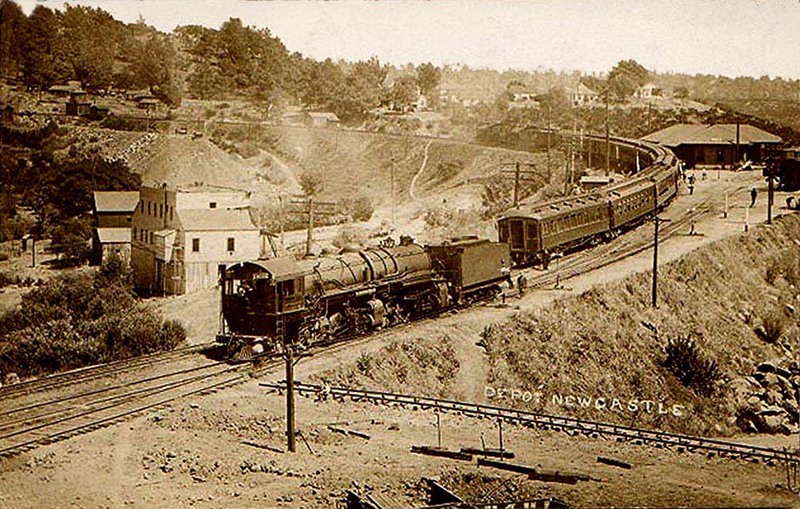 Newcastle Depot: Note the piles of earth on the left side of the picture, from the new tunnel excavation; the old grade is 10 ft higher than the new grade, 1909 photo. Courtesy of the G.J. "Chris" Graves Collection. Newcastle Railroad Map. Courtesy of the G.J. "Chris" Graves Collection. > I have four maps of the trestle, all show a curve. ... three of those maps are over 5 feet long, and 3 feet high (CPRR and SPRR Maps). 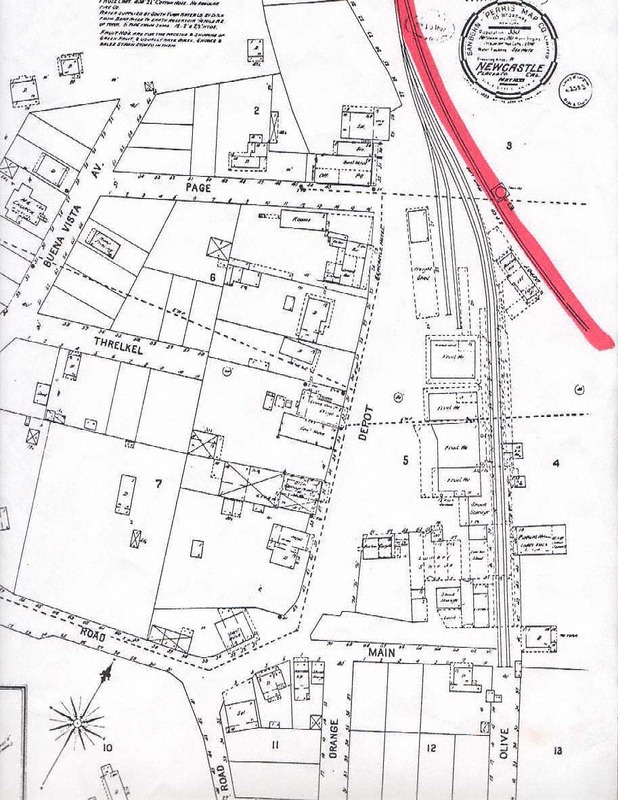 A fire map, dated May, 1899, (see above) clearly shows the DEPOT and the RR line. ... The depot is at the edge of the ravine, and the trestle goes east over the ravine. 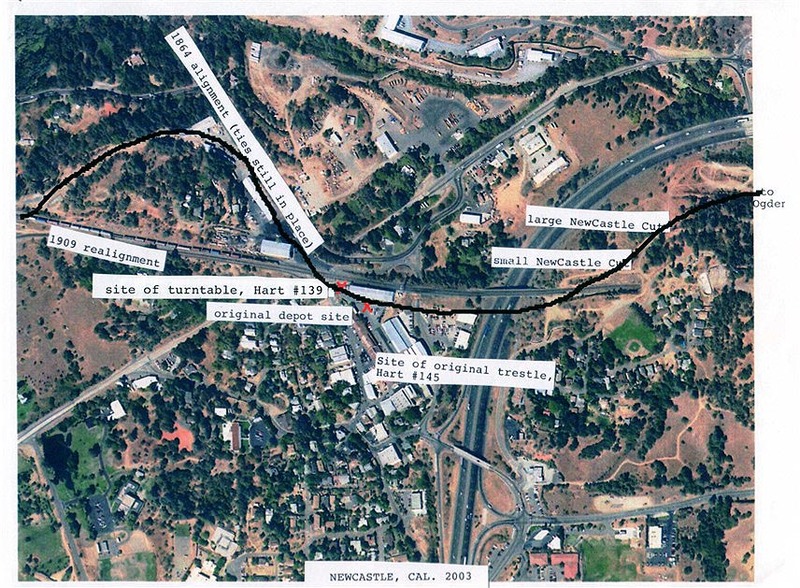 The map, showing the depot and the railroad line is clear–the railroad line, is curved, that map is being sent soon,to you via email. The larger maps show the trestle and Tunnel 18 as Tunnel 18 is being dug, shows the trestle as curved. 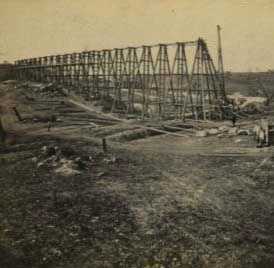 As to AA Hart 145, the photographer was standing looking back at NewCastle, that is to say, NewCastle township is on the left side of the picture, and the trestle is being built Easterly, towards Ogden. 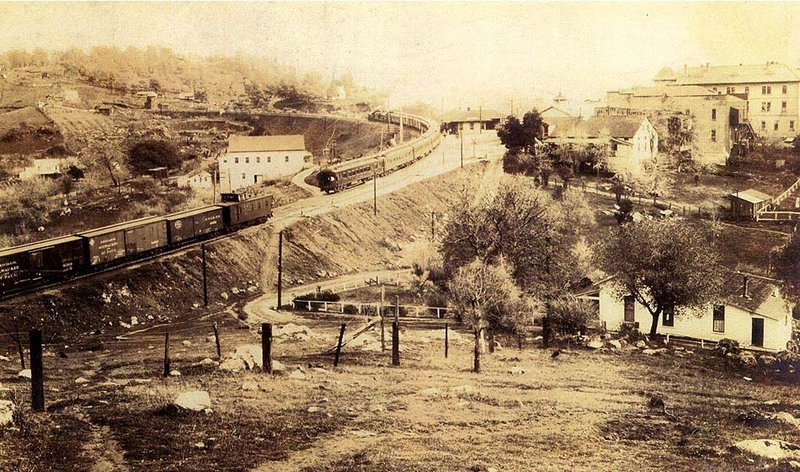 The hill behind the trestle (one can see the hill, thru the timbers) is still here, today, and has not changed. I-80 goes under the trestle, toward the right side of the picture, the first 18 trestle supports, looking left to right, are now fill, and have modern buildings on them. ... Take a peek at Hart 139—see the flat hill top that runs from right to left, in the back ground? Well, the Sacramento Valley(and NewCastle) is to the left, and knowing that, look at the construction photo again (the spindly trestle) and see the same hill, as it is flat, and sloping gradually to the Valley floor. There are two NewCastle Cuts, looking at Hart 139 you can see the shadow of the first one, and just to the left of the shadow, you can actually see the larger Cut. 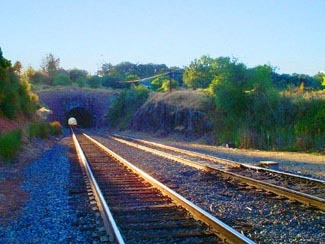 Where the shadow of the first cut is, just to the right of that is Tunnel 18, built in 1909. ... compare that photo with the 1907 and 1909 photos ... You can readily see that the railroad must bend to the left to go thru the 'shadowed' cut. ... Have spent the last two hours looking at the cut, existing grade, freeway, buildings, roads and trees. Have found the spot where the 1865 turntable was, and stood at the spot where the photographer stood, when the picture was taken. The challenge is the trees ... But, I could, when standing where the photographer stood, see thru the Cut, as he did in the picture of the turntable. ... I took a few pictures ... 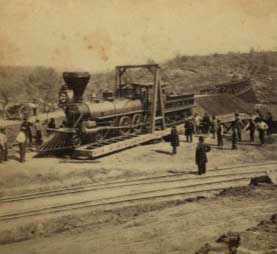 The turntable was 30 feet North-North-East of where the California State Historical monument now stands, 10 feet South of a two story tin building that totally blocks the view that was visible in 1865. The spot today is paved over with asphalt, and is a service road to the tin building mentioned above. As to Hart #145, the 1909 grade prohibits my photographing the same scene, as the photographer stood in what is now the slow lane of I-80 East —G.J. "Chris" Graves. Newcastle, California Aerial View, 2003. Courtesy G.J. "Chris" Graves. Aerial photo, taken in 2003, showing the 1864 turntable at NewCastle, as well as the site of the NewCastle Trestle. The ties are still in place, as noted on the photo, and, the only place that a person can stand and look THRU the NewCastle Cut is where Mr. Hart had to have stood; it absolutely fits where the turntable was, in relation to the existing ties. Those ties, by the way, still have 1878 rail in place, totally covered with asphalt. ... His photo, #139, clearly shows the Cut, just below the upper cross member of the turntable. The rocks shown on #139 are still in place, with that in mind, it was not hard, on the site this morning, to exactly fix the termination of the Oh! so slightly curved trestle. —G.J. "Chris" Graves. Composite Newcastle, California Digitized and Ortho-rectified Aerial Image labelled with the 1864 and 1909 grades shown clearly in red and yellow respectively. Courtesy USGS and Bruce C. Cooper.